Through his legendary abhinaya, he is the world's most famous male exponent of the characters such as Satyabhama, Usha, Chandalika, Mohini etc,. The architect of the dance form of Andhra Natyam, dance artist, guru, scholar, and musicologist, Dr. Nataraja Ramakrishna is a most highly respected Natyacharya of Andhra Pradesh, who has worked for the propagation of its ancient dance forms for over 60 years. Stemming from a legendary dance family, Professor Vedantam Radhesyam is an extremely gifted performer and revered guru of Kuchipudi Nrityam. A name synonymous with Nattuvangam, Natyacharya Mahankali Mohan features in innumerable major Kuchipudi dance productions. 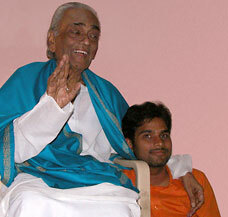 Bharatanthyam Guru and former Principal at Sri Tyagaraja Government Music & Dance College Hyderabad. Professor in music at Telegu University, vocal Guru Vasa Gopinath Rao has a deep rooted connection with the Carnatic musical tradition of Andhra Pradesh. This famous stage director is a prominent figure in the Andra Pradesh theatre world. A senior lecturer in drama, his illustrious productions have won numerous government awards.